Best Image of Francesca Lucchini? What do wewe think the letter Yoshika got from the navy boy said? Best Image of Lynette Bishop? What did wewe think when wewe watched Episode 7? The picture i have added to this swali i think would aslo be an awsome club banner let ne know what wewe think guys...P.S. larger pic is also in the images. Anyone know about what season two will be about..and is there ever going to be a series based on the witches in africa. Do wewe like the pic of Tomoko that gives info on her..if so i have many more. a pop quiz question iliongezwa: Who is the Archetype of Erica Hartmann ? 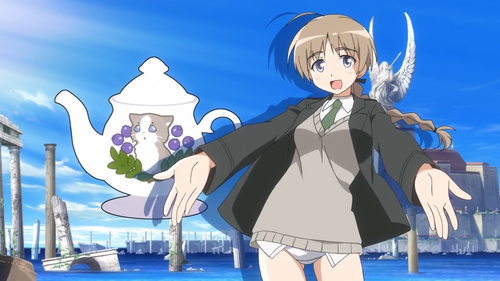 a pop quiz question iliongezwa: Who is the seiyuu of Sanya litvyak ? a comment was made to the poll: Who's your inayopendelewa character? what country is Lynette Bishop from?